"Well, I love apple crisps and rhubarb crisp - but didn't like the strawberry. I took a few recipes I found and mixed and matched and got something that everyone loved. Hope you do as well. Apples-to-rhubarb mixture can be tweaked depending on how much you like rhubarb or how tall you want the crisp to be." 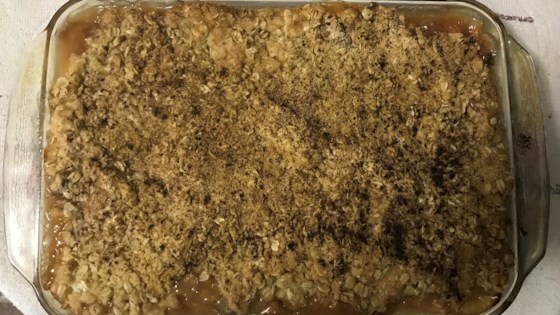 Mix apples, rhubarb, 1 cup white sugar, 1/4 cup flour, and 1 teaspoon cinnamon in a bowl until thoroughly combined; spread fruit mixture into bottom of prepared baking dish. Mix quick oats, 1 1/2 cup flour, and brown sugar in a separate bowl; cut butter into the oats mixture until crumbly. Spread the oats mixture evenly over the fruit mixture. If desired, combine 2 tablespoons white sugar with 1/2 teaspoon cinnamon in a small bowl and sprinkle cinnamon sugar over the top of the crisp. Bake in the preheated oven until the fruit is bubbling and thick and the topping is golden brown, about 45 minutes. Let cool 10 to 15 minutes; best served warm. Turned out great. I made sure that I used a pastry blender to get the perfect crumble going. I did add some other berries to enhance the flavour burst! this is probably the best apply crisp I've ever made! !